Boise Creek, which runs southeast of Enumclaw from the Cascade foothills to the White River, is a significant spawning stream for salmon and cutthroat trout. Property owners in the area share concerns about flooding, drainage, salmon recovery, invasive weeds, soil health, and degraded water quality. 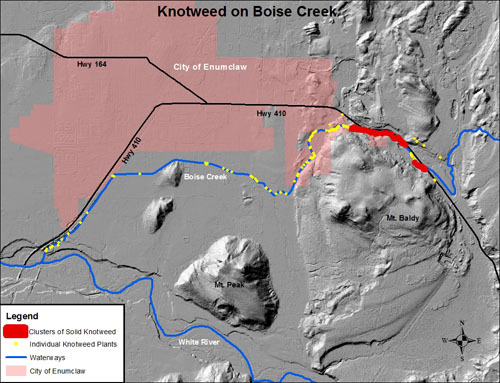 To address these concerns, the King Conservation District and the Pierce Conservation District are collaborating on the Boise Creek Community Project. Funded by a generous grant from The Russell Family Foundation and a WRIA 10 grant, the project will provide expanded services to Enumclaw area landowners. The Boise Creek Community Project team members currently include local landowner Liz Clark (of Boise Creek Boer Goats) and Stream Steward program manager Nikki Wolf. Our team is available to come and talk to local groups and school classes. We are also available for private meetings with community members. Contact us to schedule a time! And look for us around the community as we set up tables and share information about resources and services available to local landowners. Contact us if we can set up a table at your business or upcoming event! Contact Liz Clark 425-282-1901 and/or Nikki Wolf 425-282-1927. Find out more about the Stream Steward program here. Fall 2013 Salmon Run on Boise Creek This was recorded October 29 at the Lower Boise Creek Restoration Site during the fall salmon run. American Dipper Birds enjoy the logs across the creek in this recently restored area. This video was filmed on September 25th, 2012, at the Lower Boise Creek Restoration Project site, near the confluence of Boise Creek with the White River, Washington. This video was filmed May 15th, 2013 at the Lower Boise Creek Restoration Project site, near the confluence of Boise Creek with the White River, Washington. This video was filmed September 9th, 2013 at the Lower Boise Creek Restoration Project site, near the confluence of Boise Creek with the White River, Washington. Do you need to report a problem?